This is the first Joe Dassin's DVD, released in 2000. This disk contains 26 clips, partial discography, photobiography and exclusive interview taken from TV's "A bout portant". Good collection of songs, nice clips and cuts from concerts. 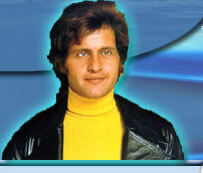 Unfortunately, many of clips were taken from two old videocompilations 1989 and 1995 ("Joe Dassin: Un ami retrouve" and "De l'Amérique aux Champs-Elysées"). To view screenshot galleries click on the images below.